We're back with a video of us checking out Lakeway Marina for an end tie or side tie for our 18 ft. wide sailboat. They're great out there and we will now have space on the end of K dock near the mouth of the cove. That will make it easier to get in and out of the marina. The lake looks pretty sad these days. But Jim and Nancy took us out sailing a week or so ago on their recently purchased O'day 32 and there is still enough lake to have fun on. We just need a couple tropical storms in Corpus and things will get better. Next stop: the Bahamas on Moondoggy with Capt. Jay and Lyse as our hosts. We fly there April 23rd. 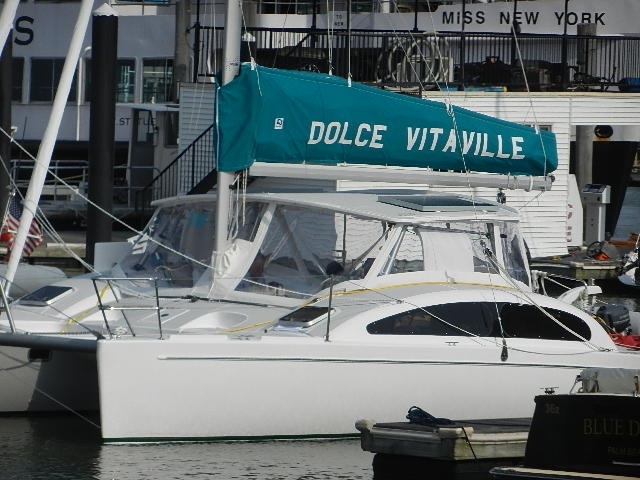 After a week in the Abacos Franci and Stephen fly to Bremen, Maine to take delivery of our Maine Cat 30, Dolce Vitaville. We will try to get a post with video out as soon as we can from the Bahamas. So long for now. We hope you enjoy the video of Lakeway Marina. Hey Francie and Steve, When you come up to Portland Maine please get in touch Maureen and I. If you are interested we would love to host you at our place on Peaks Island for a night or two. We also have a small studio apartment in downtown Portland that you could stay at if you prefer. And if none of that appeals to you then at least let us take you out to dinner at any one of many nice restaurants in Portland. Regardless, we would love to see you both and check out your new boat. My cell phone # is 207-749-0047 or home # 207-766-5980. We live on the back of Peaks Island only a 20 minute ferry ride from Portland. Good luck with the rest of your trip, looks like your having more fun the rest of us. Sorry we did not make it out there. We were pressed for time but thanks for the invite.